AirCare - MA1201: Humidifier Review • The Air Geeks, reviews of air conditioners, dehumidifiers and air purifiers. Owning a humidifier in your house has more advantages that outweigh the cost. Ever wondered why all sorts of problems start to appear during winter seasons? Everything from flu, static electricity shocks, to allergens and skin problems? Well, that might have to do with the dry air that is usually present during this cold season. AirCare Console Evaporative Humidifier MA1201 has been built to solve all these problems and more without setting you back too much financially with features that have proven to be reliable in ensuring your house is properly humidified at the recommended level. AirCare Console Evaporative Humidifier MA1201 is built to serve spaces of up to 3600 sq. Ft of space. This is space enough for some small houses. It has a 3.6-gallon capacity tank to ensure all the rooms are kept moist enough for up to 36 hours of runtime. If you don’t like having to tend to an appliance every now and then, then this is the humidifier you have been looking for. The humidifier uses cool mist evaporative technology to add invisible moisture to the air which helps to alleviate the risks static shocks that can build up on fabrics and even switches which can be very dangerous. Well-humidified air helps render flu virus powerless as at above 45% humidity, they are unable to thrive. Dry air causes you and your family to contract flu and colds. It also helps in reducing the effects of allergies, and pet dander. If exposed to dry air for long, furniture made of timber may start to shrink and deform as it continues to lose water. Having a humidified room, therefore, helps to maintain and conserve the timber consequently helping the furniture stay in good shape. It manages to do this without leaving a white dust on the furniture and walls because the water leaves all mineral deposits on the wick before being evaporated. This humidifier, therefore, manages to work even in areas where filtered water is unavailable. However, the harder the water that is being used the more the filter depletes and wears easily and therefore would require you to replace it much more often. Normally, the filter is changed once or twice per season, but that would obviously increase as the quality of water being used decreases, which might increase the cost of operating the appliance. The tank is fairly easy to fill as you just have to lay it flat in a sink and it fills up without a problem. It is also fairly easy to clean though, again, you should make sure you do this regularly, like every two weeks to ensure no mold and mildew buildup. It is advisable to disassemble the whole item and make sure you thoroughly clean using some vinegar or other disinfectants both inside and outside to make sure it stays clean. AirCare Console Evaporative Humidifier MA1201 is also easy to move around as it has small caster wheels that make it mobile. You therefore don’t have to drag the whole appliance or lift it whenever you want to change its position. It is however bulky if say you want to move it upstairs. The best way to do that would to first empty it all wait till it is time to refill and move it then. It also has an automatic digital humidistat feature that displays the level of humidity and also shuts the humidifier automatically when the level of humidity desired is attained. This greatly saves on energy as some similar humidifiers have been accused of running forever which wastes a lot of electricity. The auto-shutoff feature also shuts the appliance off when the water is used up or there is a malfunction. This can be a very useful safety feature as it can reduce the risks of burns and fires. The fans speed is adjustable to minimize the noise produced by the appliance. During the night, one can set the fans to the lowest speed which produces the quietest experience. Overall, the humidifier is generally quiet as you can watch your favorite movies or converse with each other without realizing it’s even there. It can be transferred to wherever one wishes using its caster wheels which makes it mobile. Its large capacity water tank enables it to serve large spaces. A bit noisy when running on the highest setting. This is due to the fact that it moves a lot of air which can be heard. After reading many reviewers and spending too many hours looking at different products I chose this one we could not be any happier! We run this thing all day every day and I am pleased with how easy it is to change or I should say add water we also add algae and odor treatment that we also got here on Amazon and it works awesome!" So far so good. Has been in single digit temperatures. Arrived 3 days ago already feels more comfortable in the rooms. The noise from the output can be adjusted, but it not noticeable after it runs a bit. It is sturdy and leaves no residue from the mist. Hubby feels has helped his nose from being dry. Suppose to cover a large area, Time will tell. With the cold temperatures, heat has been on 71. Humidity has not reached the 30-40 range yet.,due to the high temps running constantly. Will see how does with normal winter temps. Looks good, not too big, or heavy. Easily refillable. Have not changed filter yet, added antibacterial agent to the water." 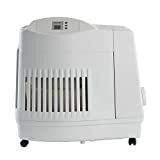 Overall, AirCare Console Evaporative Humidifier MA1201 does it job as it is supposed to despite some of the limitations as mentioned above. It is easy to set up and maintain and does not incur huge operation costs. It is also large enough to be used on large spaces which is useful if you don’t want to have a humidifier for each room. We would, therefore, give it a thumbs up to help you ensure your home has fresh moisturized air throughout.